By clicking through and going to stigpods.com you agree that you are at least 21 years old or the legal minimum age required to purchase tobacco products in your jurisdiction. When you check out on stigpods.com you agree to go through an age verification process that will confirm your age, address, and identity via a public database and our internal specialists. You agree that you will not resell any product(s) you purchase from stigpods.com, and you understand that you are strictly prohibited from distributing any product(s) you purchase from stigpods.com to any person under the minimum legal smoking age. Battery is fully charged and has enough SaltNic e-liquid to substitute for an entire pack of cigarettes. Pocket sized pod allows you to enjoy your active lifestyle free from smoke. A dense yet drippingly silky and sweet juicy mango. Revitalizing cool sensations of spearmint menthol imparts invigorating satisfaction. Full flavor Cuban cigar topped off with a drizzle of soft creamy vanilla custard undertones. Fresh watermelon with splashes of mixed melon undertones with an exhilarating menthol finish. 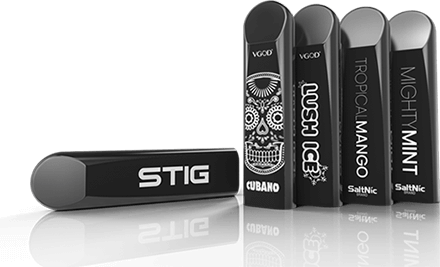 STIG, Inc. would like to make it known that there are a considerable number of companies who are attempting to replicate authentic STIG Pods with poor quality e-liquid and batteries that are also packaged with fraudulent labeling containing misleading information. Contains premium SaltNic Labs E-Liquid. Made in California. Superior fully charged cells. The word “STIG” is labeled on the battery. Authentic designs matching website images. Excellent attention to every detail. Contains substandard e-liquid with poor flavor and could possibly be harmful. Inferior cells known to fail. The word “STIG” is NOT labeled on the battery. Counterfeit labeling with incorrect information. Poor attention to detail with inferior components.